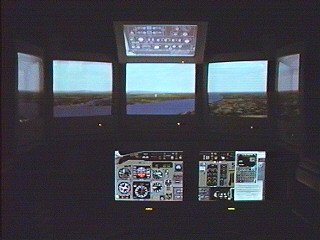 Flight Simulator cockpit project. 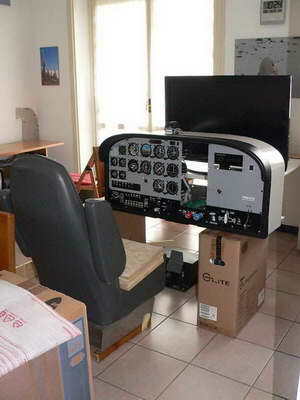 Cessna C-182 RG and Cessna C172 cockpit for Flight Simulator. MD-80 cockpit project. April 2009 - Added an MPID to facilitate ATC communications, perform check-list and consult maps. With the purpose of getting a closed, surrounding cockpit, without keyboard and mouse, I've added an MPID (Multi Purpose Integrated Display) fixing it to the control yoke, and a Tablet PC for easy chart browsing. Thanks to these two simple devices, the monitor connected to server (main PC) is used exclusively to run Flight Simulator, then I can switch it OFF and concentrate on flying, without using keyboard and mouse anymore throughout the flight! The MPID, or Multi Purpose Integrated Display is an unit buit my myself and patent pending. Please contact me if you need further information on this item. 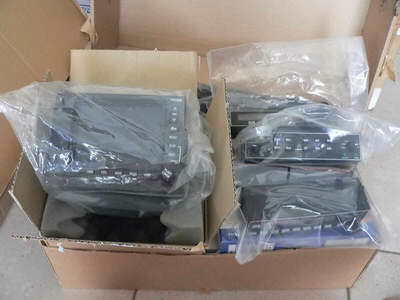 The unit has an high quality LCD monitor, letting to read comfortably even the smallest text and, in the above picture, it's used as an interface with the ATC: all the ATC messages are displayed on the monitor and the buttons can used to issue ATC commands. Of course, I use a secondary audio card in the computer, to re-direct spoken messages into an headset, keeping them separated from engine sound, and giving the ultimate surrounding experience. Now, to fully interact with the ATC, I no longer need a big monitor, no keyboard, no mouse, as I can operate it efficently from the MPID, while I'm still totally concentrated on the instrument panel and on flying! Possible alternative uses for the MPID are to display a moving map, a weather radar, a TCAS, a Google Earth satellite picture, weather information, the use is limited only by own fantasy. The Cessna cockpit is now fully enclosed and isolated from the room. The environment is fully immersive, as there are no visual references beyond the monitors and the instrument panel. The computers and the cables are now well hidden by wooden and plastic plates. The wrapping panoramic view made with 5 TVs 37" each is really impressive. The hot air is pulled out by three powerful fans mounted on the roof, while colder air conditioned air penetrates the cockpit from small openings. 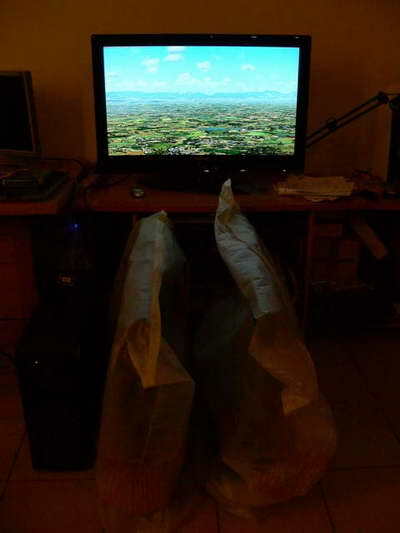 Part of the panoramic view, obtained by five 37" LCD connected to five computers and synchronized via WidevieW. 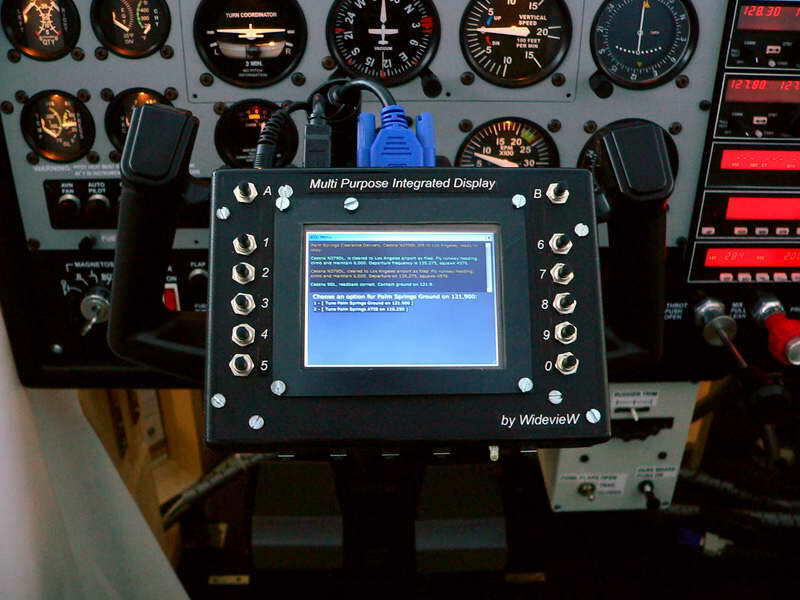 A tablet PC is used to show landing charts, while an MPID (Multi Purpose Integrated Display) is fixed to the control yoke and used to interact with ATC or use the FSX kneeboard without mouse and keyboard. All the cockpit is indeed mouse-less and keyboard-less, everything is done via real Cessna instrument panel, MPID and touch screen tablet PC. 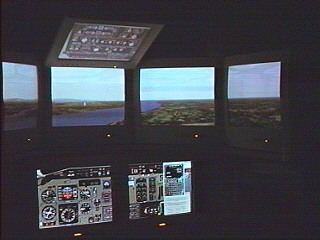 In the picture above, the Cessna flight simulator cockpit seen from outside. 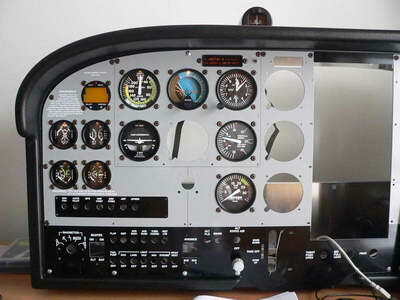 The cockpit is based on six computers, one used as server to drive the instrument panel (real gauges, GPS, radio stack, etc) and five used to drive one TV each, ensuring a stutter free panoramic view, covering 180° around the aircraft. - Windows XP Home Basic (I've avoided to use a 64 bit operative system on the server, either because it's useless when there are no scenery views, and also to prevent incompatibilities with older hardware). 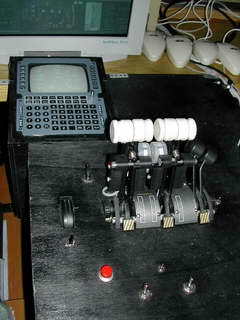 The instrument panel is a TRC472 sold by Simkits and assembled by myself. I have heavily customized it, because it is sold for a C172, but I'm simulating a C-182. So, I've added a fuel/manifold pressure gauge, a CHT indicator, a rudder trip, plus various controls present on the C-182 and not on the C-172. The tablet PC is a Fujitsu ST5112 and has charts, so I don't need to use paper in the cockpit. The small unit fixed on the control yoke, is my home made MPID (Multi Purpose Integrated Display), useful to interact with ATC and to use FSX Kneeboard without keyboard and without mouse. Again, all the cockpit is strictly based on a NO MOUSE, NO KEYBOARD and NO PAPER policy!!! The synchronization of the views is done via network by WidevieW and Widetraffic in TCP/IP mode. Software is Microsoft Flight Simulator X (FSX) with SP2 and lot of custom scenery (in particular, I have satellite scenery covering entire Italy, made by Flight Simulator Center). Everything is up and running as expected now, with WidevieW synchronizing all the displays. Future improvements will perhaps include an external structure to hide the monitor's holders, the computers and to give a general better aspect. But now its the time to put away hammers, screwdrivers and drill, and just enjoy beautiful flights. The flight deck has received all the instruments, radio stack, GPS unit and is by 95% completed. I still have to add the control yoke, rudder trim wheel, cowl flaps and parking brake switch. Everything is handled through TRC Simkits input and output boards. At the same time, I'm working on the basement and holders for TVs. Everything in home-made, using wood, as it is easier to work. The simulator takes a lot of space, see the drawing below. 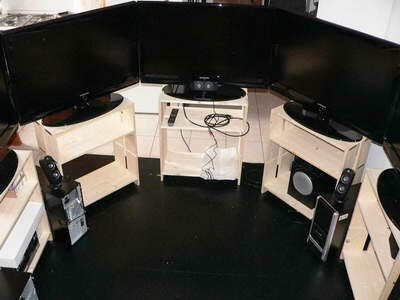 I am now working also on the basement and holders for monitors, chair, flight deck. etc. The final assembly will be huge, about 2.6 x 1.8 meters wide and 1.2 meters high. In order to get the exact sizes and to not make mistakes with holders and basement's shapes, I've used PC boxes and other equipment to put the flight deck, chair and front monitor in correct place. Just before assembling the altimeter. It is probably the most difficult gauge to build, but paying lot of attention and working carefully, it will definitely work as expected. The flight deck is receiving more gauges daily. All the monitors are arrived. They are 5 in total, for a full 180° panoramic view. Each monitor is a Samsung LCD TV, 37" diagonal size, 10000:1 contrast ratio, 1920*1080 resolution connected to PC via DVI=>HDMI cable. They will be placed along a circle, with the complete flight deck in the front. I'm still studying how to mount and hold them all together. There are definitely too many boxes in my dining room. This Cessna C-182 RG cockpit will be based on six networked computers, driving five Samsung 37" HD monitors (1920*1080) for a full 180 degrees view. 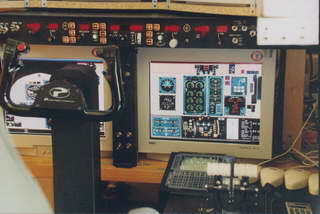 The cockpit will work with FS2004 and FSX. 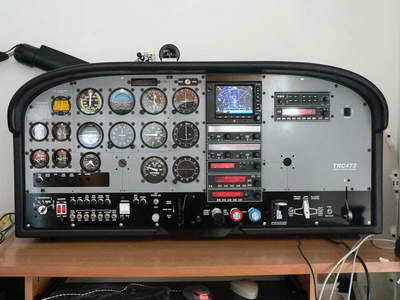 As said before, the instrument panel and case was purchased from TRC Development b.v as "kit". 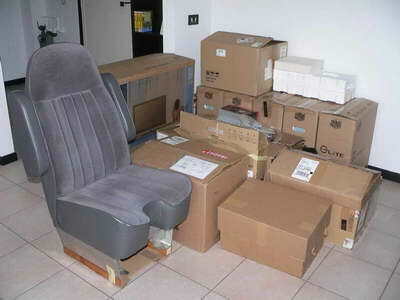 This means that you receive about three boxes full of pieces to assemble. 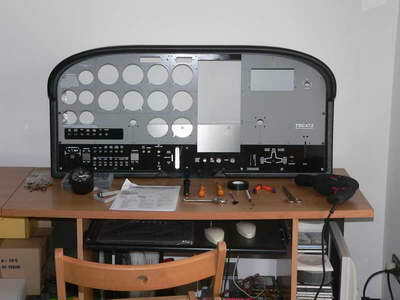 This picture shows the progress building the cockpit case, that has required just one day working alone. I'm now going very fast because I cannot wait to have everyting assembled and working (but I know... several weeks will be required, including the structure to hold the monitors). I have tried to assemble my first gauge, in this case the vertical speed indicator, which is probably one of the simplest. 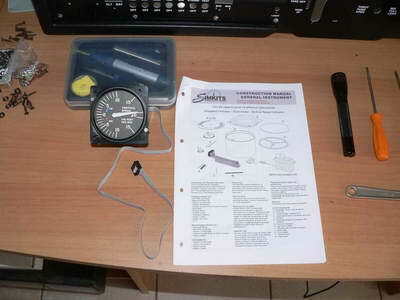 Assembling the gauges wasn't too difficult and is very enjoyable if you like to build things by yourself. A very detailed documentation for each gauge is available on Simkits website, for best results you must follow such documentation strictly as indicated (you know... once you make an hole or glue something, you cannot use "Edit => Undo" or reset the flight !!!). In case you prefer to receive everything assembled in factory, built and tested gauges, as well as the entire cockpit, are available at an additional cost. The boxes of the wonders. 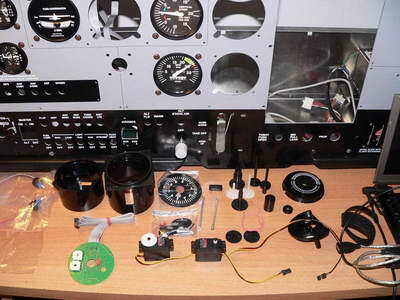 They contain all the gauges to assemble, the radios (ready for use) and a replica of Garmin 500 GPS (ready for use as well). 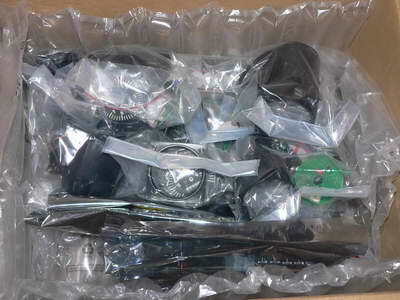 I have received all the items just a few days after the order, everything was ready for immediate delivery. I have really appreciated a so prompt delivery time, because in the world of flight simulation it is not uncommon to have to wait for weeks (or months) when you order special devices. 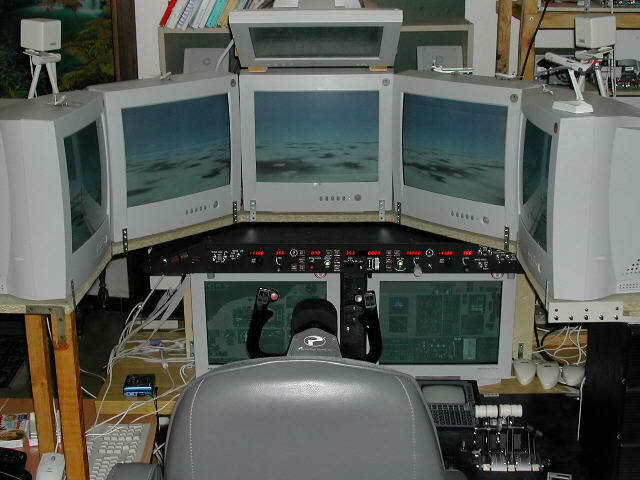 February 2002 - I'm working and improving my cockpit each day. My final goal is to reproduce a MD-80 EFIS/FMC as best as possible. My current setup includes nine monitors, two for the main panel, one for the overhead panel, one for the FMC, and five for 180° full-screen outside view. 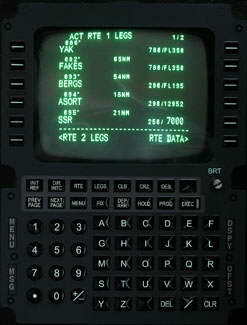 The server has an EPIC card inside, several commands are still given clicking with the mouse on the screens, but the flight guidance, the FMC and the TRC are hardware made and they resemble the real aircraft very closely. 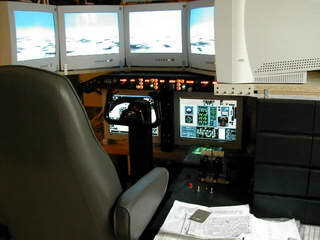 As input peripherals, I'm using high quality controls (hydraulic Rudder Pedals by Flight Link, full-size Jetliner Yoke by Precision Flight Controls and professional throttle Ministudio Jet Console by SafeLine). Future upgrades include an hardware overhead panel and radio stack. Furthermore, I would like to totally eliminate both the keyboard and the mouse, using only actual switches and buttons. For the software, I'm still using the excellent Microsoft Flight Simulator 98 on the server, Mad Dog by Rodolfo Arata / LAGO and FS_METEO by Marc Philibert with permanent connection to Internet. 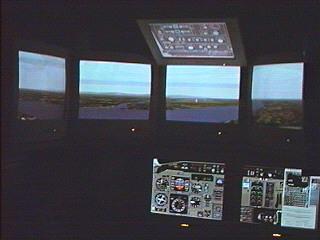 Microsoft Flight Simulator 2002 is used on the clients only, for scenery display. I've created a special version of WidevieW and designed compatible scenery on the 98's side in order to make the simulators compatible between them. Hardware components are complex. The server is an AMD Athlon at 1000 mhz with 256mb of SDRAM and three video boards: (Matrox G450 Dual Head AGP and PCI) capable of running a total of 6 monitors. Two 17" NEC FE700 monitors (on the bottom of the picture) at 1280x1024 are used for the primary instruments, while a 15" LCD monitor by Likom (1024x768) is used for the overhead panel (I've had to use a LCD to save space and weight, as it is positioned over my head). The FMC has a SVGA 5 inches green-phosphor monitor, like in the real thing. The sound board is a Creative Sound Blaster LIVE with Four Point Surround. Input peripherals are connected to the server, which is the computer where I actually fly. My clients PCs are five, one for each outside view (17" monitor at 1024x768) and are based on AMD K7 1800+, Geforce 2MX graphic board, 256mb of SDRAM, local 20GB hard drive (7200 RPM), no floppy, no CD-ROM, no sound. 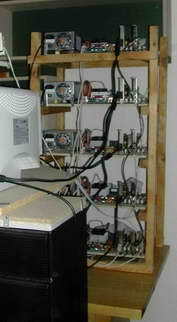 The computers are networked using regular $15 10 megabits network board and coax cable. Some of them has dual network interface for Internet (FS_METEO) connection. The cockpit under the light. Other views of the cockpit and of the excellent Rodolfo Arata's Flight Guidance. The central pedestal (still uncompleted) with the FMC. On the right, the rack-mounted PCs controlling the five external views.